The east coast of Spain, particularly the area that lies within the Valencian Community offers some of the best bird watching in Europe. Bird watching in Valencia is extremely diverse owing to two key factors. Firstly, the geographical position of Spain is directly on a major migration route for a vast array of species. The fact that many migrating birds use the coastline as an aid to navigation means that they pass over and stop off along the Valencian coast. The second major positive influence for bird watching in Valencia is the hugely diverse habitat range. I have lived in Spain since 2006 and since then have “birded” throughout Valencia on a regular basis. Despite the diversity of habitat and species, it quickly became apparent that the area is not that user-friendly to the visiting birder, especially those from abroad. With that in mind, when I decided upon a complete career change in 2009 I made the decision to establish Valencia Birding. As a professional and licenced guide I provide guided bird watching trips and holidays throughout the Valencia region. I offer anything from a single day trip for an individual to a week´s holiday for families or groups. My client base is truly international, and I´ve had the pleasure of providing guiding services to visitors from USA, Australia, New Zealand, UK, Finland, Germany, Holland and Belgium. Many have combined a day or two of birding with other holiday plans whilst others have relied on me to arrange their holiday accommodation too. By working with a close team of collaborators, including local hotels and guest houses, I can provide “tailor-made” packages to suit the clients´needs. The habitat of the Valencia region differs greatly and as such is home to a stunningly diverse range of bird species. Perhaps the best known area is the Natural Park of Albufera de Valencia. This freshwater lake, surrounded by rice fields and reed beds has an eco-system all of its own. The rice growing cycle ensures that the habitat is ever-changing, and as it does, so does the bird life. 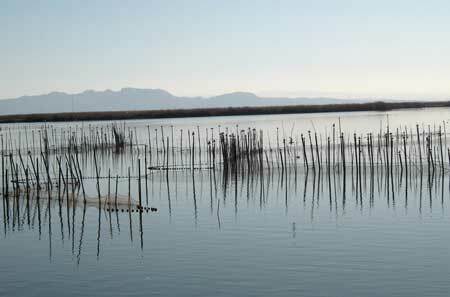 In spring, Albufera de Valencia provides breeding grounds for Little Egret, Cattle Egret, Great Egret, Grey Heron, Purple Heron, Squacco Heron and Night Heron. Other, rarer breeding species include the Purple Swamp Hen and Crested Coot. In winter, tens of thousands of ducks arrive from Northern Europe and beyond. Species include Garganey, Pintail and Teal. Other classic Albufera species include Spoonbill, Marsh Harrier, and countless waders such as Spotted Redshank, Little Ringed Plover, Curlew Sandpiper and Black Tailed Godwit. Other coastal sites of Valencia provide habitat for the critically endangered White Headed Duck together with other species such as Collared Pratincole, Whiskered Tern, Glossy Ibis and Little Bittern. The rugged crags and mountains of the Valencian Sierras are perhaps the most impressive landscapes of the entire area. Summits of over 1,100 metres above sea level, knife-edge ridges and soaring limestone cliffs form a truly dramatic environment. This is where we can find many of the region´s birds of prey. 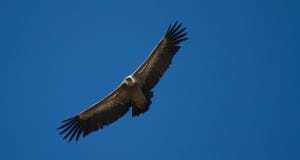 The mighty Golden Eagle breeds annually, as does Booted Eagle, Bonelli´s Eagle, Griffon Vulture (below) and Eagle Owl. Other mountain species include Blue Rock Thrush, Black Wheatear, Alpine Swift, Crag Martin and Alpine Accentor. The steppe and lagoon of Castilla de la Mancha lies just outside the Province of Valencia but is easily accessible for a day trip. The habitat is in complete contrast to the rocky sierras that are to be found further East. Vast areas of steppe are located at heights in excess of 1,000 metres above sea level. “Big skies” and wide open spaces make this area very special although life in this area is only for the hardy. Night time winter temperatures plummet way below freezing whilst the heat of summer can be in excess of 40 degrees C.
The classic steppe species include the World´s heaviest flying bird, the Great Bustard, together with Black Bellied and Pin-tailed Sandgrouse, Little Bustard and Stone Curlew. Rock Sparrows and Calandra Lark are other typical species. The area´s lagoons hold Greater Flamingo, Black-Necked Grebe, Gull-Billed Tern and Whiskered Tern. Migration time on the steppe can yield many surprises including Honey Buzzard, Crane and Dotterel. It is a privilege to provide bird watching trips in such a wonderfully diverse area and although the hours of work are long, it is exceptionally rewarding to experience the thrill of a client who sees specific species for the first time, or enjoys a particularly good view of a bird previously only seen in brief glimpses. There are often very special moments. Crisp cold sunrise out on the steppe in winter is stunning. Sunsets in Albufera are always beautiful but when experienced from beside a roosting spot for Squacco Herons they take on an extra special dimension. Day trips and holidays are available throughout the year. There´s always something of interest to see in this beautiful area of Spain. Owner & Bird Watching Guide at Valencia Birding.